Bill Lamming from Kingston-upon-Hull in East Yorkshire is best known for the chunky ancient and medieval and Renaissance figures  all with separate heads and weapons - he produced in the 1970s. 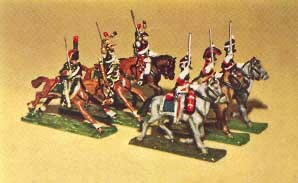 These slightly toy-like, heavy-set and short-legged figures ("the joke that went around was that all Bills figures had his legs" recalls Terry Wise) feature extensively in the Bruce Quarrie edited PSL Guide to Wargaming and a unit of Romans is to be seen on the cover of Charles Grants Wargame Tactics. Lammings early output was altogether more conventional in body-shape and far slimmer in build. Lamming took up figure designing when he retired from the police force. His first models were some 54mm troops issued in 1965 when his company was named Lambro Products. At this time Lamming appears to have been working alongside Peter Kemplay  a figure painter and diorama maker from Skipton in North Yorkshire. Kemplay later ran The Northern Garrison in Knaresbrough one of Lammings main agents and went on to set up his own hobby supply business in Ipswich which acted as one of the main agents for the Tradition 25mm and 30mm ranges. Lammings first 20mm range covered the Seven Years War. It was launched early in 1968 and included British, French, Austrian and Prussian troops. The details we have of the range are sketchy but it appears that it included all arms, some artillery pieces and a fairly wide variety of troop types including a mounted British colonel. A photo in Wargamers Newsletter shows a gun and four-man artillery crew plus an officer. Infantry figures sold at one shilling (5p) and cavalry for 2/6d (12 p). Unusual amongst designers Lamming made all his master figures in brass. His wife Rene handled the administrative and financial side of the business. By 1970, when Lamming launched his 20mm Napoleonic range, the Seven Years War range seems to have been dropped. Adverts for The Northern Garrison in 1970s issues of Scale Models mention only the Napoleonics and in an article on gaming the Jacobite Rebellion that appeared in Miniature Warfare in January 1972 author Stuart Reid states "Lamming are no longer producing Seven years War figures". The Napoleonic range was extensive and covered French, British and Prussian armies. In the manner of the day these were described as 20mm but in fact they are roughly the same size, or slightly taller than Minifigs S range. They are mounted on thick oblong bases, which have slightly textured and uneven surfaces. The code number is scratched on the underside. In an advert in the October 1970 Scale Models Northern Garrison claimed that the wargamer "will be delighted by their jewel-like precision and quality". The figures were sold in boxes of five infantry, two cavalry or two guns and limbers. Officers were sold separately. The infantry boxes retailed at 6/8d (roughly 34p). Reviewing the range in Military Modelling in March 1971 John Cross noted, "They are nice, clean, clearly detailed castings of good quality. Horses in particular are quite nicely done". In Wargamers Newsletter meanwhile Don Featherstone was so taken with the artillery pieces that he said he was tempted to "replace all my artillery with them". A couple of years later some of the Napoleonic figures were remodelled in what Lamming described as a "more robust style". Inevitably this meant bigger and fatter. The original 20mm Napoleonic range is on the listing page of this section. The later Lamming ranges of Ancients, Medieval and Renaissance figures are still available from B&B Wargames in Hull. In the 1970s Bill Lamming began to work for the scenics company Gallia who made a large range of buildings for wargamers. Unfortunately he discovered that he was allergic to resin and was forced to retire. Some while later he abandoned military modelling and wargaming in favour of a new hobby  butterfly collecting. "He was a really nice man who was always enthusiastic about everything he did," Terry Wise says. A mixture of Lamming Napoleonic cavalry, from left to right: French Elite Hussar; French Dragoon; French Cuirassier; Scots Grey and Dragoon Guard.